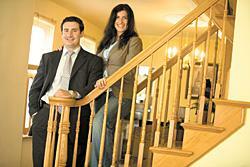 Nikolay Todorov, a Keller Williams Realty broker, and his fiancée Liz Etzel in their Canton home. When Nikolay Todorov arrived in America at age 19, it was a country he’d only heard about in movies. By his own account, he brought only a suitcase full of clothing and $200, and came from his native Bulgaria ready to work. And work he did — about 100 hours a week, he said, for those first few years — as a lifeguard and later a bartender at the Baltimore Hyatt Regency hotel by day, and baking bread at a local Safeway by night. He obtained a green card, then started attending investing workshops, and finally found a good job selling jewelry at kiosks in the Inner Harbor, a job that led to a position as a manager. His story is a version of the classic American immigrant narrative, updated for real estate investors: Six years later, Todorov owns two houses near the harbor, has invested in and sold eight more and wears a suit and a handsome silver wristwatch to work as a broker with Keller Williams’ newly-opened Southeast Baltimore location. Todorov left his native Bulgaria because, he said, the country’s post-Communist government has been overrun by corruption, and the only people who stood a chance in the business world there come from old money. He did not. Both of his parents worked middle-income jobs in a shipyard, his mother procuring parts to build engines, his father inspecting electrical systems. While working at the kiosks, Todorov started attending workshops at Investors United School of Real Estate, where he got a crash course in the basics of the trade. “Nik is a people person, and … he’s not afraid of hard work,” said Ian Charles Parrish, president and founder of the school. Since graduating, Parrish said, Todorov has sold a number of properties that he purchased from real estate wholesalers through Auction Brokers LLC, an auctioneering company owned by Parrish’s father. The practice of buying wholesale properties and the networking and hobnobbing it requires for success have become Todorov’s specialty. A wholesaler, rather than listing a property on commonly used listing services, controls a for-sale property by putting it under contract, then sells it, often at auction, to a new buyer, at a profit, before actually closing on the sale. Todorov bought his own home, a century-old end-unit row house on Robinson Street in Canton, in late 2006, for $310,000. Three months later, he paid a wholesaler $82,000 for a three-unit rental property on O’Donnell Street in the far East Baltimore neighborhood of Graceland Park. Todorov said he paid $15,000 as a down payment and got a fixed-rate mortgage at about 8 percent interest, and that the mortgage, including taxes, comes to about $6,000 per year. At $450 per unit per month, Todorov said he makes about $600 cash per month on the property and plans to reinvest the money in his next venture: a commercial property in Southeast Baltimore. He said he and his fiancée have several business ventures in mind that could benefit from a headquarters. Todorov said his strategy is to meet wholesalers at networking events and on Web sites such as Craigslist, buying properties from them and re-selling them at auctions. The advantage to selling wholesale properties at auction is that they go quickly, and don’t wallow for months on listings services with constant haggling over price, according to Parrish. But some real estate agents, like Clausen Ely of Results 1 Realty, said the nature of the Baltimore real estate market is such that there are a lot of first-time home buyers who don’t have the cash to meet reserve prices set at auctions. First-time buyers tend to get the best deals when working with an agent who knows his or her neighborhood, Ely said. But for buyers strictly interested in investment properties, or buyers with deep pockets, auctions do speed things up. But even as he hustles to broker sales and accumulate a portfolio of properties that stands out from the pack, Todorov said he still thinks it important to do good work, not just a lot of work. In his living room, a narrow table is covered with the pieces of an enormous, half-completed jigsaw puzzle that he says he works with his fiancée, two or three nights a week — it may be the perfect metaphor for his philosophy of work. “All I know,” he said, “is that it takes a lot of patience and determination to finish something as complicated as this.